Rajasthan GK Question Sample Paper 4: Rajasthan General Knowledge Sample Question Paper No. 4 with Collection of Rajasthan GK Questions under Over GK Quiz in PDF @ Rajasthan GK Sample Papers. Q.1 First time Cement Production plant in Rajasthan started at ? Q.2 Deficiency of Vitamin D gives rise to ? Q.3 Justice JS Verma Committee is related to ? Q. 4 MNIT is Located at ? Q.5 "Akshardham Temple" is located at ? Q.6 Maharana Pratap University of Agriculture and Technology (MPUAT) is located at ? 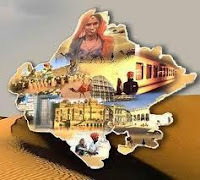 Q.7 Largest Division of Rajasthan in term of Population ? Q.8 "Tannot Mata" Temple is located at ? Q.9 Amar Sagar is located in ? Q.10 Commissionary System was re-enforced by Govt. of Rajasthan from ? Q.11 The Author of 'Annals and Antiquities of Rajasthan' was ? Q.12 The Ancient "Shurusen Desh" was ? Q. 13 Which Districts among following Do Not have river ? Q. 14 "Rajasthan Police University is announced in which city ? Q.16 Modern Jaipur was founded in 1727 by ? Q.17 Which among following is NOT archaeological site in Rajasthan ? Q.18 Shape of Rajasthan State is ? Q.19 Rajasthani song Kesariya Balam is of ? Q. 20 Ranthambhor town was founded by ?